Anyone in need of a weekend getaway should consider the Joshua Tree/Palm Springs area, especially considering that you can take a tour of Blu Homes' first SoCal project. Built from a cluster of Origin modules, the Joshua Tree desert home features an abundance of natural daylighting complimented with shade to maximize light and minimize overheating. Tim Disney, great nephew of Walt Disney and a Blu Homes board member, is opening up his home this weekend on September 15 and 16 for public tours. A perfect excuse for a desert trip in our opinion. With Blu Homes’ new Vallejo, CA factory, the prefab home builder is making a big push to expand its product throughout the West Coast. The company’s first Southern California project is Tim Disney’s prefab home in Joshua Tree. He and his family are opening up the house for public tours this weekend, so those interested can get a first hand look at what the Blu Homes prefab experience is all about. 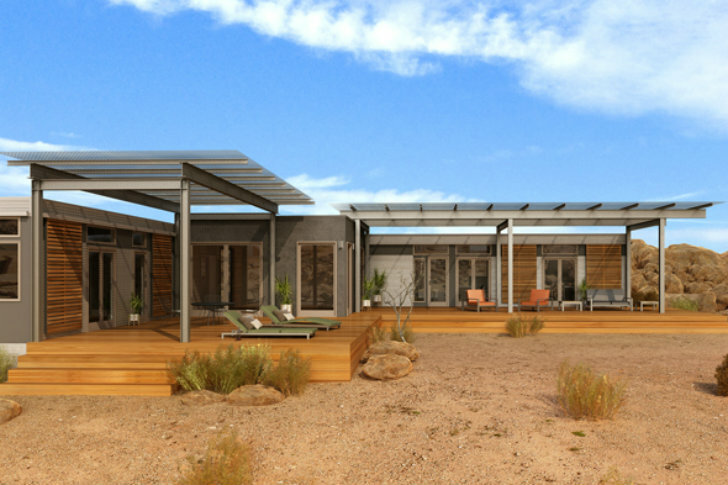 The Joshua Tree home is composed of two Origin modules set at a right angle to create a sheltered and shaded courtyard space. An additional Origin module placed at a slight distance serves as a guest cottage. The home was built in the factory in eight weeks, then trucked to the site where it was set on its foundation and unfolded. All of the appliances, cabinetry, wiring, plumbing and lighting were already installed upon arrival. Once unfolded, the site crew set to work sealing up the house, installing the cladding, connecting to utilities and finishing out the interior. The home includes ash cabinetry, Caesarstone countertops, bamboo radiant floors, Anderson windows and a photovoltaic system over the carport. The owners wanted to create a strong connection with the outdoors and exterior living spaces play as strong a role as the indoor ones. Recently, Blu Homes teamed up with online real estate broker Redfin to help home buyers find the perfect spot for their new home. Blu Homes is holding public tours this weekend on Saturday and Sunday, September 15th and 16th from 10-5 pm. Register for the tours via Blu Homes’ website. And be sure to watch the video of the home unfolding below. With Blu Homes' new Vallejo, CA factory, the prefab home builder is making a big push to expand their product throughout the west coast. 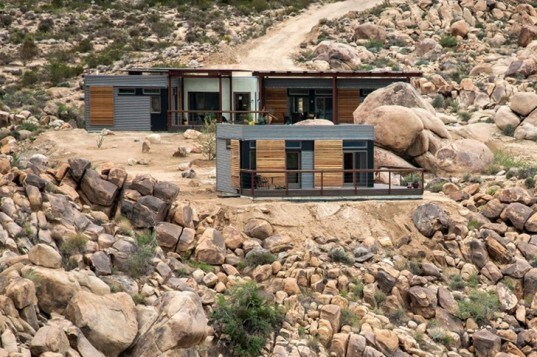 Their first Southern California project is Tim Disney's prefab home in Joshua Tree. He and his family are opening up the house for public tours this weekend so those interested can get a first hand look at what the Blu Homes prefab experience is all about. The Joshua Tree home is composed of two Origin modules set at a right angle to create a sheltered and shaded courtyard space. An additional Origin module placed at a slight distance serves as a guest cottage. The home was built in the factory in 8 weeks, then trucked to the site where it was set on its foundation and unfolded. All of the appliances, cabinetry, wiring, plumbing and lighting were already installed upon arrival. Once unfolded the site crew set to work sealing up the house, installing the cladding, connecting to utilities and finishing out the interior. The home includes ash cabinetry, Caesarstone countertops, bamboo radiant floors, Anderson windows and a photovoltaic system over the carport. The owners wanted to create a strong connection with the outdoors and exterior living spaces play as strong a role as the indoor ones. Recently Blu Homes teamed up with online real estate broker, Redfin, to help home buyers find the perfect spot for their new home. Blu Homes is holding public tours this weekend on Saturday and Sunday, September 15th and 16th from 10-5 pm. Register for the tours via Blu Homes' website.